Congrats to Paola Longoria on her win in the 2019 LPRT Sweet Caroline grand slam from Greenville, SC. – She makes it 6 wins out of 6 tournaments on the season. – She’s built a nearly insurmountable lead over #2 Salas for the current season rankings, leading her by near 900 rankings points. – Kelani Lawrence got a solid win over LPRT touring vet Maria Renee Rodríguez in four games. – Natalia Mendez took out Mary Mary Dee Kirchoff in three straight; this was a notable match up in that Kirchoff is literally three times Mendez’ age. Bravo for still competing in your 60s on tour. – Youngster Ana Laura Flores took out veteran Susy Acosta in four close games. 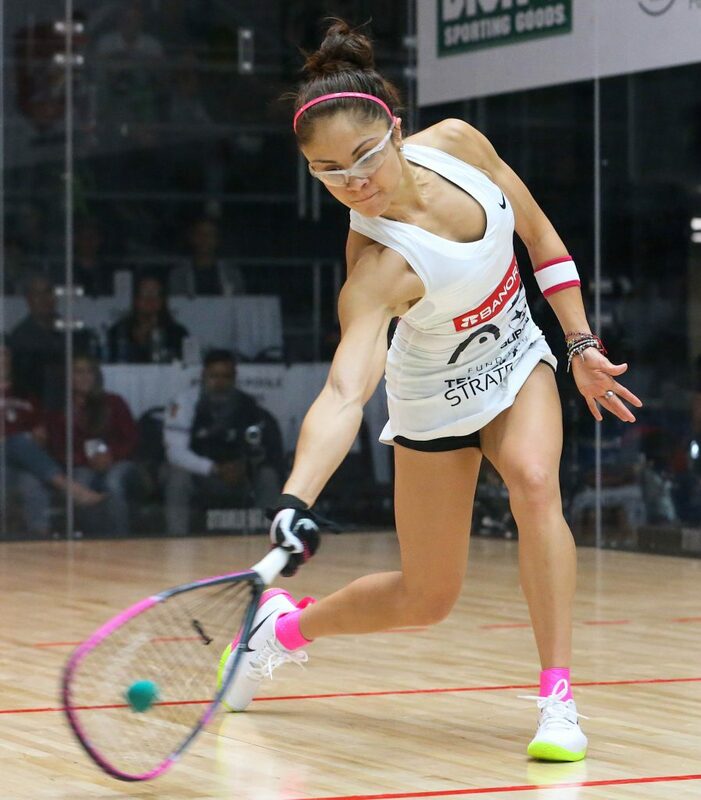 – Biggest upset of the round: collegiate player Hollie Rae Scott took out the 39 seed Cristina Amaya 12-10 in the 5th. Career win for Scott. In the 16s, mostly chalk and easy wins for the top seeds, but a couple of matches worth noting. – #5 Rhonda Rajsich had to face her doubles partner in Sheryl Lotts and won in three games. (Sheryl went on to take the Women’s Open draw 11-10 in a thrilling tiebreaker win over Amaya). – #3 Alexandra Herrera was donuted in the second game against Lawrence …then donuted her right back and won by the unique scores of 8,(0),0,8. Its not often you see someone both give and take a donut in a match. – But the big upset of the round was #10 Adriana Riveros taking out #7 Natalia Mendez 11-7 in the breaker. – #1 Paola Longoria advanced in 3 games over the woman who vanquished her in last year’s worlds final Ana Gabriela Gaby Martinez 8,8,6. This is the third time they’ve met on tour this year, all 3 game wins for the champ. Longoria improves to 15-1 career h2h over Martinez in all competitions, making last year’s worlds final look like the aberration, not the predictor. – #4 Maria Jose Vargas took revenge over last tourney’s loss to Rajsich, beating her in four games to take the slim lead in their h2h matchups. – #6 Nancy Enriquez advanced to just her 3rd career semi-final with a come-from-behind win over #3 Herrera. Enriquez dropped the first two games, then blitzed by Herrera in games four and five, 2 and 1 respectively to advance. – #3 Samantha Salas Solis fought off the upset-minded Riveros 6,9,4 to try to continue her finals streak on tour this season. – #1 Longoria improved to 31-1 all time in all competitions over Vargas, though she had to come from a game down to do it. – #2 Salas improved to 6-2 all time in all competitions over Enriquez, but not without having to work for it, coming from 2-1 games down to win in a tiebreaker. – Longoria improved to 55-3 all time over her doubles partner Salas with a relatively straight forward 1,2,6 three game win. Salas never seemed like she was a threat to Longoria on this day, leaving opportunities up and quickly becoming frustrated with her opponent’s consistency. In doubles, Longoria made it a double, winning the doubles title with her finals opponent Salas over the Argentine national doubles team of Vargas/Mendez. As with Singles, Paola has now won all 6 pro doubles events this season, 5 of them with Salas. Longoria improves to 109-5 in pro doubles since we started tracking it in 2013, winning 38 of the 43 doubles events she’s now entered. Next on the schedule for the LPRT is the big Bolivian Grand Slam, a combo IRT/LPRT event in Cochabamba, the first time either pro tour has ever been held in Bolivia. Next PostNext PRS incorporates short URL service for its posts.